Participants: Rt. Hon. Nick Herbert MP, James Clappison MP, Robert Halfon MP, Peter Bone MP, Simon Marcus PPC, Thomas Pursglove PPC, Henry Newman. In February 2014, CFI led delegation to Israel and the West Bank with four Conservative MPs, two Conservative prospective parliamentary candidates (PPC) and a Special Adviser in attendance. CFI were joined by Former Minister for Policing and Justice Rt. Hon. Nick Herbert MP, CFI Parliamentary Chairman James Clappison MP, Robert Halfon MP and Peter Bone MP. The group also included Simon Marcus, PPC for Hampstead and Kilburn, and Thomas Pursglove, PPC for Corby, as well as Special Advisor Henry Newman. The group were given the opportunity to meet and hear from a range of top Israeli experts, senior politicians, and journalists, as well as representatives from the Palestinian Authority. Delegates made contributions to each of the briefings, by chairing the meetings and asking questions. On Monday the delegation headed to Israel’s northern border with Lebanon, where they were accompanied by former IDF Colonel and spokesperson Miri Eisin. Eisin briefed the delegation on the complexities of the border region with Lebanon, Syria and the Golan Heights, including Hezbollah’s possession of an estimated 50,000 rockets. At the Golan Heights the group received a briefing about the IDF’s medical treatment of over 800 wounded Syrians so far, as well as hearing first-hand the ongoing conflict in Syria. 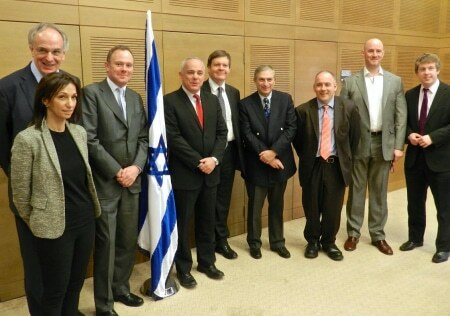 The group were given the opportunity to meet with several senior politicians from across the political spectrum at Israel’s Knesset.The CFI delegation heard from Yuval Steinitz, Israel’s Minister for Intelligence and Strategic Affairs, Dov Lipman of Yesh Atid, Nachman Shai of Labour, and Tzachi Hanegbi of Likud. Delegates also witnessed a vote in the Knesset’s chamber. To accompany the day in the Knesset, the group received an in-depth briefing by Professor Reuven Hazan, lecturer of Political Science at Hebrew University, on the various forces in Israeli politics, and the quirks of the nation’s electoral system. Additionally, the visit featured a meeting with British Ambassador to Israel, H.E. Matthew Gould at his Residency in Tel Aviv on Wednesday evening. Ambassador Gould provided an in-depth tour of the most pressing issues in the region, as well as taking questions from delegates. Dr Eran Lerman, Israel’s Deputy National Security Adviser for Foreign Policy and International Affairs, gave delegates an insightful analysis of regional issues, speaking at length on Iran, the peace process, Syria, and the BDS movement. Delegates also heard from Benjamin Krasna, Director of Political-Economic Research and Analysis at the Ministry of Foreign Affairs who spoke extensively on Iran’s nuclear proliferation and the potential consequences for the region. A comprehensive tour of Israel’s security barrier was given to the group by Dr Danny Tirza, the chief architect of the project, who explained that only 5% of the barrier consisted of concrete wall. On a visit to the West Bank, parliamentarians met and were briefed by Palestinian Authority officials in Ramallah, including PA Spokesman and former Foreign Minister Nabil Shaath. Prior to that, delegates were given a scene-setting briefing by the Israeli-Palestinian Chamber of Commerce, who spoke extensively on the increasing bilateral trade and investment between Israel and the Palestinian Authority. The West Bank visit ended with a tour of the first Palestinian planned city of Rawabi, which seeks to be a prosperous centre for business, and expects to house 30,000 Palestinians. The group heard at length about why Israel is now known as the ‘Start-Up nation’, as leading venture capitalist Elan Zivotofsky of crowdfunding company OurCrowd gave an informative briefing on Israel’s flourishing tech and start-up scene. Also featured was a meeting with the leaders of the social innovation hub Present Tense, which works to foster Israel’s next generation of social entrepreneurs. A detailed briefing was received by the group on Palestinian Authority-sanctioned incitement by Palestinian Media Watch’s director Itamar Marcus. Mr Marcus highlighted numerous examples of incitement towards Israel found in Palestinian sports tournaments, cultural events, radio programmes, and television programmes aimed at children. The group toured the Old City in Jerusalem, visiting some of the main historical sites, including the Western Wall. MPs paid a moving visit Yad Vashem Holocaust Memorial in Jerusalem where James Clappison MP, CFI’s Parliamentary Chairman, laid a wreath on behalf of the delegation. A morning was spent in Shaare Zedek hospital in Jerusalem, where patients from all backgrounds coexist peacefully and are treated side by side. MPs saw first-hand the kidney dialysis treatment of Jewish Israeli, Israeli Arab, and Palestinian children. The group heard a political briefing from David Horovitz, the founding editor of The Times of Israel current-affairs website, which was established two years ago and has since become a leading news source on Israel and the region. On one evening Avi Issacharoff, former Haaretz journalist who currently writes for the Times of Israel, shared his thoughts with delegates on the prospects of peace. "Every visit to Israel is memorable and this trip proved no exception. I won’t easily forget the moment the deceptive tranquillity of the Golan Heights was shattered by the deafening explosions of rockets mere miles away from the border with Israel. I was deeply affected by an apparent off-the-cuff observation by a young IDF soldier about anticipating a busy afternoon treating those Syrians injured in the explosions at a nearby IDF field hospital." "It is my firm belief that only by visiting Israel can Parliamentarians begin to truly understand the complexities of this extraordinary country and its neighbours." "CFI must be credited with producing such an extensive itinerary, with visits that were both moving and informative. It is no exaggeration to say that this visit will stay with me for the rest of my life. I am deeply grateful to CFI for the extraordinary opportunity they gave me and I very much hope to return as an MP."